The Bozburun (“gray cape”) site lies at the base of a cliff, called Kucuven Burnu, on a sloping, sandy bottom. The visible portion of the site is a mound of amphoras approximately 20 meters long and 8 meters wide, although there are many artifacts lying in the rocks of the cliff face. The upper end of the primary mound, hard against the base of the cliff, lies at a depth of 26 meters. The last visible amphoras at the far end lie at approximately 34 meters, although it is apparent that material continues under the sand. The lowest datum points currently established lie at 36 meters. Three examples of galley ware from the stern area (Photo: INA, BK95.32). The amphoras appear to be of two major classes common toward the end of the first millennium AD. The dominant class, are often referred to as “pyriform” (pear-shaped) or “ovoid” (egg-shaped) and are characterized by a tapering, ribbed body with rounded shoulders and round bottom without a foot; the neck is relatively tall and narrow, with a heavy, distinct rim, and the wide handles rise from the upper shoulder to just below the rim. The best parallels found so far are dated to the second half of the ninth century and come from kiln sites in the Crimea. 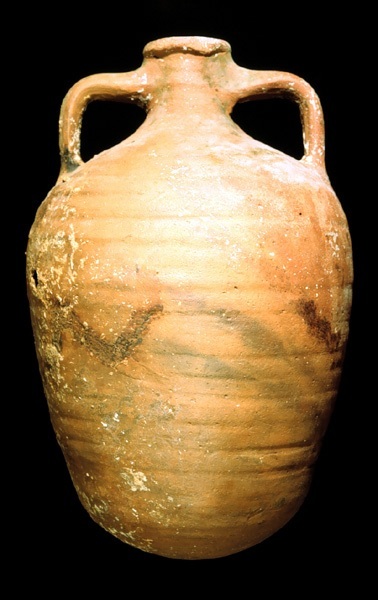 The second class, noticeably shorter, with a wide, flaring neck and flat bottom with central dimple or kick, may be from the Sea of Marmara region (see the section on amphoras for more details). An example of a ‘pyriform’ Class 1 amphora (Photo: INA, BK98.16). In addition to the whole and broken amphoras that make up the greatest part of visible material, there are several concretions visible, and a collection of small bricks and building stones in the upper part of the site. Based on similar finds at Yassi Ada, it is currently thought that this may be the remains of the hearth. Anchors, of cruciform type, have been found on the rocks at the top of the wreck and mixed with the tumbled amphoras at the bottom. Based on the finds to date, it is expected that the upper end of the site is the stern. The site has long been known to Turkish sponge divers and was shown to George Bass during INA’s first survey in 1973 by a diver from Bozburun, Mehmet Askin. The site was surveyed in greater detail in 1982, when test pits revealed well-preserved (for Mediterranean waters) hull remains beneath the sand in two places. On the 1982 survey, another local sponge diver was interviewed, and he reported that the site had been known to his colleagues for some time, and perhaps as many as 50 whole jars had been removed over the years for use as water jugs on sponge boats. The site was also visited in 1992, to check out reports that the site was being looted (there is no obvious evidence of disturbance, but only a comparison with photos taken in 1982 will reveal whether significant damage was done), and in 1994 for the purpose of planning the excavation. A total of three amphoras, all of the first, pyriform class, were raised by INA before excavation began in 1995. A few amphoras in the Bodrum museum, donated by sponge divers, may also be from this wreck. Overall view of the site prior to excavation. The bow lies down slope. (Photo: INA, BK86.03). During the first season of excavation, initial topographical mapping of the site was completed, along with the establishment of primary datum points and a grid of 2-meter squares. Some excavation was carried out in a few of the squares that had visible remains, but in no place was the bottom of the deposit reached. 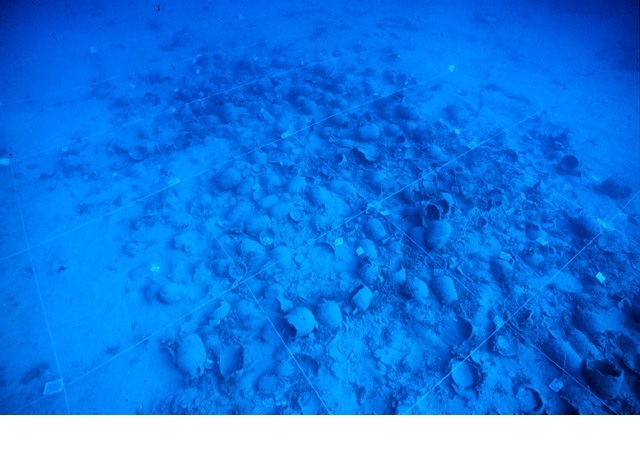 It is clear that over some of the site, the broken and scattered visible amphoras lay atop a layer of amphoras still stacked as they were in the ship. The upper layers also appear to have slid and rolled down slope somewhat as well, since the squares excavated at the bottom of the mound revealed only tumbled amphoras lying on sand. A large quantity of broken sherds were recovered (most were redeposited on site, in square M9), as well as about forty whole or nearly whole amphoras, a number of partial amphoras, and a small number of non-amphora finds, such as a pitcher, several bricks and tiles, and a few lead fishing weights (the last probably intrusive). The small hull section that was exposed in 1996 (Photo: INA, BK74.06). In 1996, during a long and productive season, work concentrated on the upper half of the site, although Dave Stewart and Korhan Bircan continued their work on two lower squares. In addition to lots of amphoras, including examples of a possible third class, small finds included galley pottery and a glass goblet were recovered. Removal of much of the broken material from the upper end revealed a large area of amphoras still stacked in the bottom of the hold, running from square F11 down to H11. H11 also contained the first coherent hull remains we encountered. Although only a small area was exposed, this included the keel, four frames, four bottom strakes, a stringer and ceiling. The keel and planking are of oak, the remainder of pine. Dendrochronological analysis of two of the frames was inconclusive. 1997 was the year of the amphora. Primary excavation goals for the season were recovery of as much of the cargo as possible and further investigation of the hull remains. Nearly 500 amphoras were removed from the site, although not all were brought to the surface (approximately 175 were stored on the bottom, off site). Divers looking at the lower half of the site can largely thank Robin Piercy, David Stewart, and Bill Charlton for the moonscape. At the upper end, the after three meters of the hull remains were exposed and some of the timber recovered. More frames were exposed in unit J11, and a concentration of tiles and stones first identified in 1995 was largely mapped and recovered. This area also yielded a collection of cooking pots, as well as other domestic objects. A mate to the glass goblet found in 1996 was recovered in the stern, as was a fine glass flask that may go with the goblets. 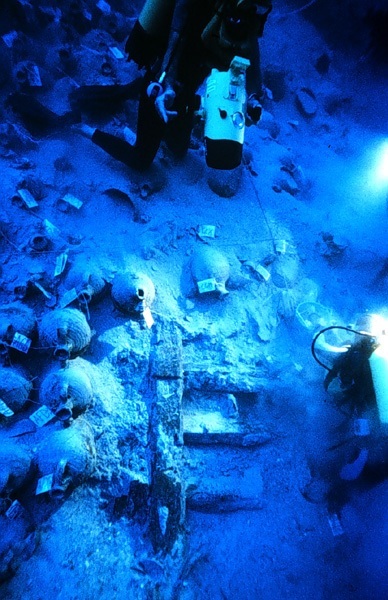 The second season of excavation on the medieval shipwreck at Küçüven Burnu (latitude 36° 43.5′ N, longitude 28° 05.1’E), near Selimiye Köyü (Marmaris, Mugla province) on the Hisarönü Peninsula of southwestern Anatolia (Fig. 1), began on June 2, 1996. The excavation was conducted by the Institute of Nautical Archaeology under the overall direction of Prof. George F. Bass and field direction of Dr. Frederick M. Hocker. The work was authorized by Ministry of Culture permit no. 95/6987, issued June 22, 1995. The Ministry of Culture was represented by Mr. Erhan Özcan, of the Bodrum Museum of Underwater Archaeology. The site was first reported to the Ministry in 1973, as a result of a survey for shipwrecks in Turkish waters conducted by George Bass and the Institute of Nautical Archaeology. The site was one of several shipwrecks shown to the INA team by Mr. Mehmet Aikin, a sponge diver from the village of Bozburun, not far from Selimiye. The wreck first appeared as a low mound of amphoras approximately 20 meters long and 8 meters wide in the sloping, sandy bottom at the base of the Küçüven Burnu cliff (Fig. 2). The mound is oriented almost directly north-south, with the southern (upper end) lying at a depth of 26 meters and the northern (lower) end at 36 meters. In addition to the mound, a number of whole and fragmentary amphoras are scattered about the bottom either side of the mound and in the rocks of the cliff above the mound. Some of the scatter is a result of the wreck, as the material is firmly concreted into the rocks in places, but some is doubtless the work of visitors to the site. A few other artifacts, including other ceramics, several pieces of concreted iron, and one broken Byzantine-type anchor, were visible in the wreckage and on the rocks. The site was the subject of regular monitoring by both INA and the Bodrum Museum, and has been surveyed in 1973, 1982, 1990, and briefly in 1994 in preparation for the excavation. In the course of the surveys, three amphoras were recovered and deposited in the Bodrum Museum of Underwater Archaeology. 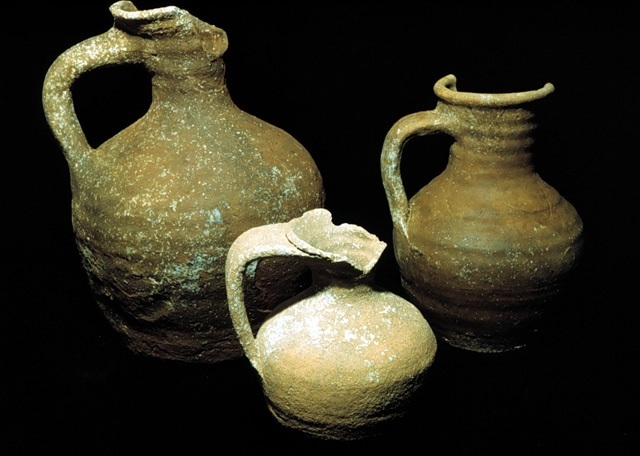 These amphoras provided a preliminary date for the wreck in the later ninth or early tenth century, and appeared to match jars found on kiln sites in the Crimea, Ukraine. Excavation in 1995 revealed that the bow lies down slope, and that the lower layers of the amphora cargo are largely intact. As in 1995, accommodations for project staff and work areas were established in an olive grove (rented from a local farmer) on Si_ Bay, which can be reached by car from the village of Selimiye by an unpaved road leading northwest out of the village. The camp, which included dormitories for up to 40 people, sanitary facilities, and a cooking/eating building, as well as the recompression chamber to treat potential diving incidents, was built by project staff as a temporary facility, to be dismantled between seasons and at the end of the project. In 1996, a larger facility for cataloguing and conserving finds was added, as was a storage area for intact and nearly intact amphoras, to alleviate storage problems experienced in 1995 and to minimize handling and transport of amphoras. The camp also features a small boat dock, from which the excavation site can be reached in as little as three minutes by sailing out of Si_ Bay to the north, around Küçüven Burnu and back to the southwest. The camp is supplied with Belediye water and electricity. Additional laboratory facilities and secure artifact storage are maintained in a rented house on the same bay. This building is also used for winter storage of camp and excavation equipment. The excavation was conducted from a cement and wooden platform constructed on a projecting spur of the Küçüven Burnu cliff. This structure features several decks or levels, each with separate functions. On the southwest side is a large cement floor, which supports a 45 kW diesel generator to power all of the excavation machinery. This generator, which weighs over 1.5 tons, and had to be moved onto the platform by hand, is permanently installed for the duration of the excavation and is protected by a steel cover. This level also supports two low-pressure compressors to power airlifts that remove sediment from the site. There is a boat dock on the southwest side as well, so that boat traffic can come and go without endangering divers working from the other side of the rock. On the north side of the spur are three levels of wooden platforms. The lowest of these, only 50 cm off the water, is the diving platform from which divers enter and exit the water. This level was expanded in 1996 to provide more working space and safer transfer of recovered material to boats for transport back to the conservation facility. The next level up is the timekeeper’s station, from which diving operations are directed and where artifacts are sorted and preliminarily catalogued. The third level is primarily a waiting and dressing area for divers. As the site lies at least 26 meters deep, provisions for safe diving operations were a priority. The project dives on compressed air using dive tables compiled specifically for the project by Dr. Richard Vann of the Diving Physiology Research Center of Duke University. Using these tables, each excavator dived for 25 or 30 minutes in the morning and 20 to 30 minutes in the afternoon, following a five-hour surface interval. Several divers worked for up to 40 minutes at a time during the last four weeks of the season. Normally, excavators dived in teams of four, and up to six teams in succession could dive both morning and afternoon, although the usual number of dives was five. Divers decompress at a depth of 6 meters on pure oxygen, supplied from the surface, for up to 35 minutes after each dive. Although this requires the transport and loading of heavy, unwieldy cylinders of compressed oxygen, it has been shown, largely through INA diving projects in Turkey, that in-water oxygen decompression adds a significant safety factor to deep diving on compressed air. Additional safety precautions included the recompression chamber in camp less than five minutes away. Every participant was trained in the operation of the chamber, as well as in first aid and CPR for diving situations. All divers had to pass an orientation and acclimatization dive course in the first week of diving before being cleared to work on the site. Divers had to demonstrate not only basic scuba technique and familiarity with safety procedures, but also had to demonstrate competence and confidence under water. A hyperbarically-trained physician was on site at all times to treat potential diving accidents. In total, 2,189 individual dives were executed, including training and acclimatization dives. Over the course of the season, no confirmed incidents of decompression sickness or embolism occurred, although one possible case of decompression sickness (diagnosis and treatment inconclusive) was treated in the recompression chamber. Küçüven Burnu, the rocky headland at the entrance to Selimiye Bay. The arrow points to the location of the wreck and the dive platform, at the base of the limestone cliffs. (Photo: INA, BK44.68). Work in 1995 had largely consisted of establishing the limits of the site and fixed reference points for mapping, with a small amount of excavation. In 1996, after the network of datum points established the previous year was expanded by the addition of four raised towers, significant progress was made in the excavation of the upper two-thirds of the site. Goals for the season were the removal of as much of the jumbled and broken remains of the upper cargo layers as possible, mapping of the in situ amphoras beneath, and exposure of at least a small part of the hull remains. A secondary goal was the exploration of the sand pockets and ledges above the amphora mound in order to better define the stern part of the wreck. The upper trench begun in 1995 was continued, and completed down to the intact lowest layer of amphoras all the way across the site. A second, longitudinal trench, in row 11, was completed down to the same level about half way down the slope. Each excavator was assigned a single square. Excavation proceeded by hand fanning with heavier spoil removed by airlift. All artifacts encountered were tagged, bagged and removed to the surface for preliminary cataloguing. Heavier artifacts, such as amphoras full of sediment, were raised to the surface in padded baskets with the aid of lifting balloons. Sediment samples were taken for palynological and composition analysis on a regular basis and whenever unusual sediments were uncovered. All recovered artifacts were labelled by lot number based on provenience, with complete or nearly complete artifacts assigned individual inventory numbers beginning with the prefix BK (for Bozburun-Küçüven Burnu). Altogether, 1,701 lots were catalogued. All diagnostic artifacts, including individually inventoried objects and objects catalogued by lot number only, were stored in water until the end of the season, when they were returned to the Bodrum Museum of Underwater Archaeology for conservation and permanent storage. Whole amphoras were stored in a secure fenced enclosure built in the bay directly in front of the camp, while other objects were stored in water in the excavation house near the camp. A little less than 40% of the site has now been cleared of the underwater equivalent of the “plough zone,” where the cultural material has been disturbed by post-depositional processes, from disintegration of the hull after it came to rest on the bottom to anchors dragged through the mound. The latter remains a problem, as local fisherman often anchor near the cliffs. Two whole amphoras noted but not raised in 1995 were smashed over the winter, probably by an anchor dropped on them, and a modern anchor, recently lost, was found just off the site. The broken and jumbled material consists almost entirely of eroded sherds from amphoras; much of this material cannot be joined and preserves no significant diagnostic information, such as rim profiles or graffiti. After cataloguing, the majority of this material, consisting primarily of amphora body sherds, was redeposited in a sherd dump excavated to the west of the site. All together, over 600 kg of sherds were redeposited. Sherds saved for further analysis include substantial partial amphoras (often, the neck, handles and shoulder survive as a unit) and large shoulder sherds. The latter are cleaned in the field to determine if they have any graffiti or pot marks. If no marks can be found, they may be redeposited as well. A sample of the sherds was also saved for composition and fabric analysis. The less disturbed material beneath the upper layer is often still in situ, and the trench through row 11 revealed a large area of amphoras which are still in their original positions in the hold of the ship. The removal of the upper layer also revealed a small area of well preserved hull remains in square H 11 (Fig. 3). Hull remains were also noted in F 11, J 11, K 11 and K 12, indicating that the in situ amphoras in row 11 are protecting an extensive area of the hull. These amphoras were consequently left in place after mapping, to be removed in later seasons. A total of 140 whole amphoras were recovered in 1996, along with a similar number of substantial partial amphoras. Two major classes of jars had been identified in 1995, a numerous ovoid class and a more conical, flat-bottomed variety of which only a few examples were found. Further examples of Class 1 were recovered in 1996 (for example, BK 58 , Fig. 4), as well as several examples of a new ovoid type, with a distinctive neck and handles (BK 108, Fig. 5). This type helps to refine the date of the wreck, as parallels for this type and the Class 1 amphoras are generally considered to overlap only in the 9th century. The whole jars, some of which still had their stoppers (of either clay tile or wood) in place, were emptied of the sediment they contained. The sediment was sieved and floated for organic remains and samples saved for palynological analysis. Several loose stoppers (such as lot 2240, Fig. 6) were recovered as well. Preliminary analysis of the contents indicates that nearly all recovered amphoras were carrying wine, although one jar contained olives. In addition to amphoras, examples of domestic pottery were recovered in the stern, primarily in squares F11 and F12. Three nearly intact pitchers of different sizes and styles (BK 86, 163, 178, Fig. 7-9) were recovered in a group in the upper left corner of F11. Two of these were found well down in the deposit, between two frames, where they had apparently rolled after the wreck. Fragments of cooking pots in the same square, as well as more of the square stone tiles located in 1995, continue to suggest that either the ship’s galley was originally in this area or collapsed into this square as the upper hull disintegrated. A copper jug (BK 83, Fig. 10), very similar to one found on the 7th-century vessel at Yassi ada, was found next to the group of pitchers. It is of similar size and was probably tableware as well. It is in very fragmentary condition and was raised in two pieces, but is sufficiently preserved to allow a complete reconstruction. Another possible item of tableware, a glass goblet (BK 179, Fig. 11) was found up slope and to the west, in square E10. Although broken between amphora sherds, the profile is nearly complete. No exact parallels have yet been found, but the basic form is well known from Roman and Byzantine sites. Glass stemware is an unusual find on Mediterranean shipwrecks, probably because of its fragility. This piece may be a personal possession. Lead fishing net weights (Fig. 12) continue to be found around the periphery of the amphora mound, usually as single finds or in small clusters of two or three. These are almost certainly intrusive, the result of fishermen catching their nets and lines in the wreckage. Macro organic remains found throughout the sediment are probably also intrusive. Oak leaves, acorns, and small twigs occur from the surface of the sand down into the amphora mound, but are most likely detritus from the rocky slopes above the site. The same is probably true of two goat teeth and a bird leg bone found at the upper end of the site. Two items of ceramic tableware, a drinking bowl (BK 52, Fig 13) and narrow-mouthed jug (BK 53, Fig. 14) were found just to the west of the amphora mound while making alterations to the telephone booth. These items were recovered, but were later determined to be of Roman date, probably from the 1st or 2nd century AD. Subsequent exploration in the rocks to the west revealed other pieces of Roman pottery, including a large amphora, suggesting that there may be a wreck (previously unknown) in deeper water. Hull remains exposed in H11 include partially integrated structure from the bottom of the ship (Fig. 3 and Fig. 15). The keel, including a complex scarf, bottom planking, four frames, and a variety of internal longitudinal timbers are all represented in the small area exposed. Because the remains are in the middle of the ship, the frames were numbered sequentially from the top of the square to the bottom beginning at 50. The timbers were carefully cleaned of sediment, photographed and measured in detail. Samples for dendrochronological analysis were sawn from the eroded ends of frames 51 and 52, and smaller samples for wood species identification were sawn from the keel, planking, and internal timbers. After sampling, the remains were covered with sandbags and loose sand to protect them for the winter. The dendrochronological samples are currently undergoing analysis at Cornell University; the other samples have been analyzed by the United States Forest Products Laboratory. The results so far indicate that the keel and planking are of white oak (Quercus sp. ), and the internal timbers (frames, stringer and ceiling) are all of pine (Pinus sp.). More exact identifications are not possible without bark or leaves, but the oak is very likely holm oak (Quercus ilex), the only large oak that grows in quantity in the eastern Mediterranean or Black Sea region. This is an unusually early example of oak planking in a Mediterranean vessel. Previously, oak was not thought to have been extensively employed in shipbuilding before the 13th or 14th century. At the end of the excavation season, after backfilling sensitive areas of the site, the airlifts were dismantled and their rigid exhaust pipes stacked at the top of the site. The telephone booth was raised for cleaning and repainting, and the decompression line, shotline and boat moorings removed. Following the close of diving operations, remaining uncatalogued artifacts were documented and all artifacts packed for shipment by truck to the Bodrum Museum of Underwater Archaeology, where they are undergoing conservation.